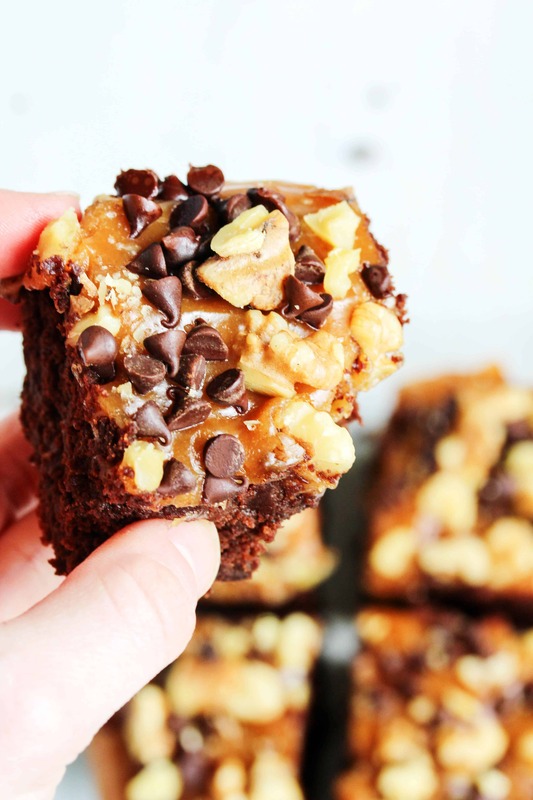 These Samoa cookie bars have something for everyone! 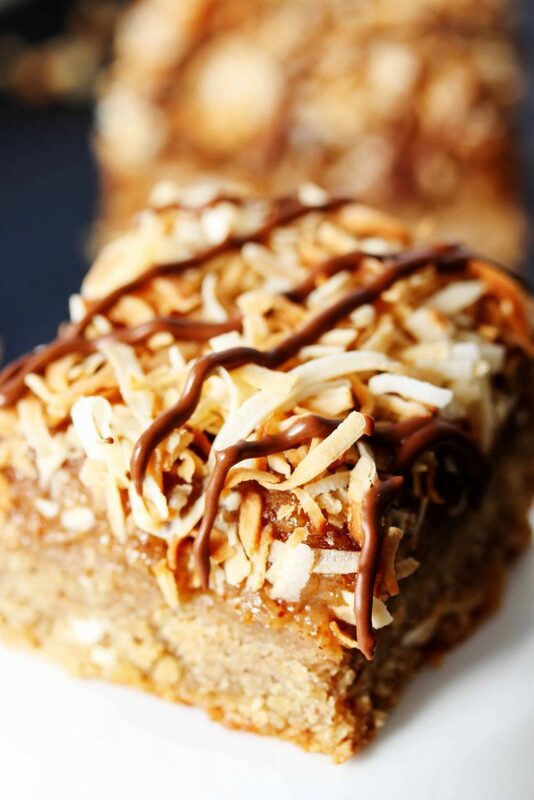 They’ve got a dense, slightly chewy base with a creamy caramel middle, and are topped with coconut and chocolate. They’re basically a party in your mouth! I probably haven’t had Girl Scout cookies since I actually was a Girl Scout *cough* 20+ *cough* years ago. When you are a Girl Scout you’re basically obligated to buy a couple of boxes of cookies. And let’s be honest, this girl only joined the Girl Scouts for the cookies. Oh, and the patches. And if there was a dessert eating/making patch, I’d have been covered in them! Food is pretty much the sole reason I join anything. 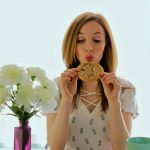 So, once I was no longer a Girl Scout, there were no longer Girl Scout cookies in my house, no matter how much begging I did. And I wasn’t begging for the Thin Mints like everyone else. 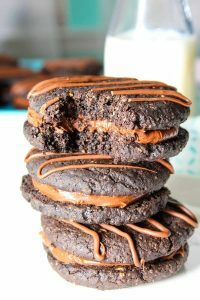 I was all about the lemon sandwich cookies, the chocolate coated peanut butter sandwich cookies, and my all-time FAVE!, the Caramel DeLites aka Samoas. 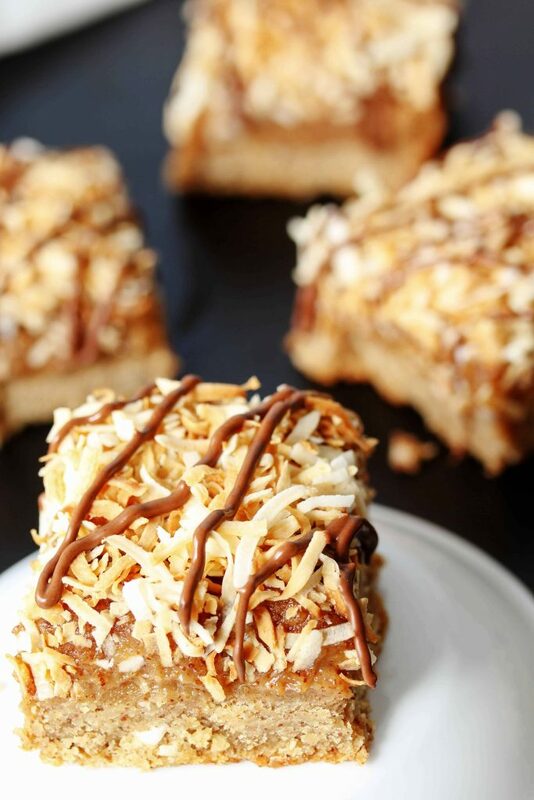 If you don’t know, Samoas consist of a vanilla cookie topped with caramel and toasted coconut and drizzled with chocolate. What’s not to love!? Just give me a sleeve of these cookies and let me be on my way. Make the cookie base. Nothing fancy to see here. The vanilla cookie base is so easy to mix together. It bakes a little before the rest of the layers are added, which gives you a nice, dense cookie with crispy edges. 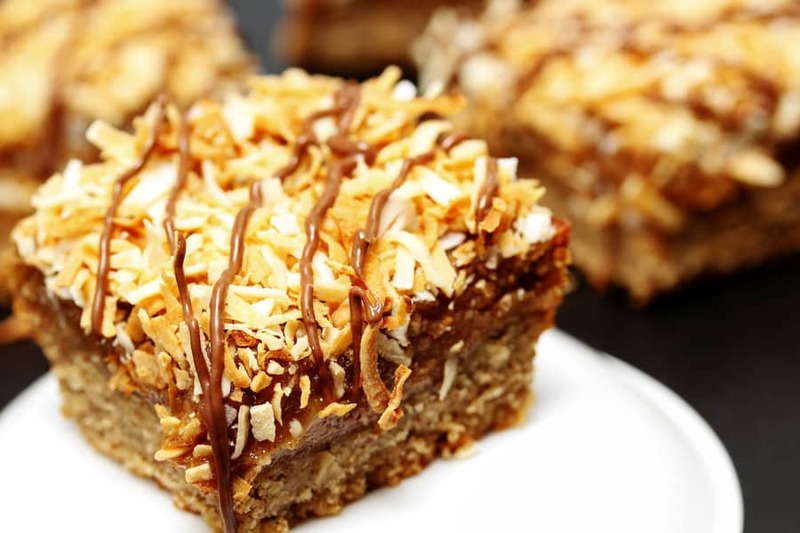 Add the toasted coconut and chocolate drizzle on top. The most important step: Eat Them! It doesn’t get much easier than that, right!? 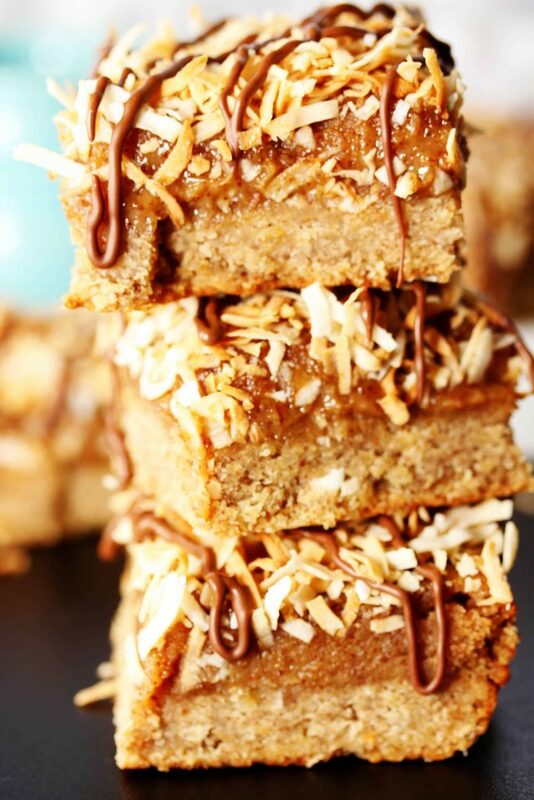 If you make these Samoa Cookie Bars, or anything else from Healthy Hacks, be sure to tag me @HealthyHacksRD! I love to see your creations! Preheat oven to 350 F and line a 9”x5” loaf pan with aluminum foil or parchment paper leaving a few inches of paper hanging over the sides to use as handles to get the cookies out of the pan. 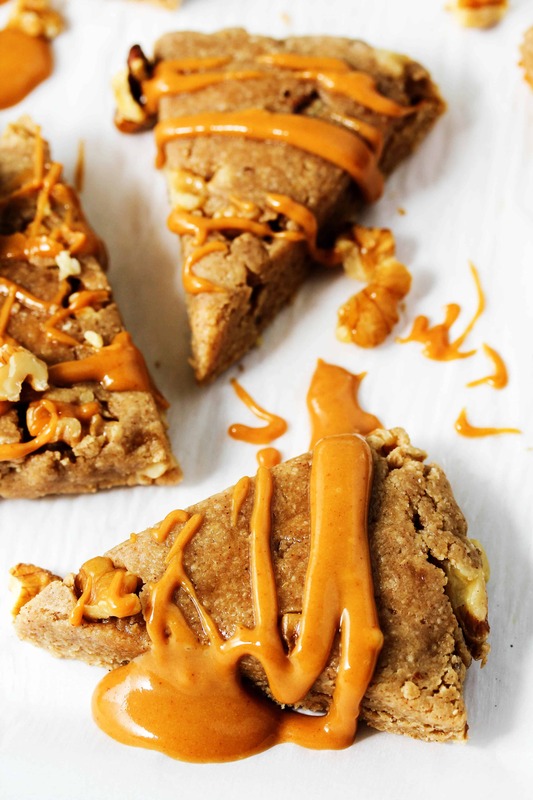 For the caramel, in a medium sized bowl, stir together all the ingredients. Place in the refrigerator to thicken up. 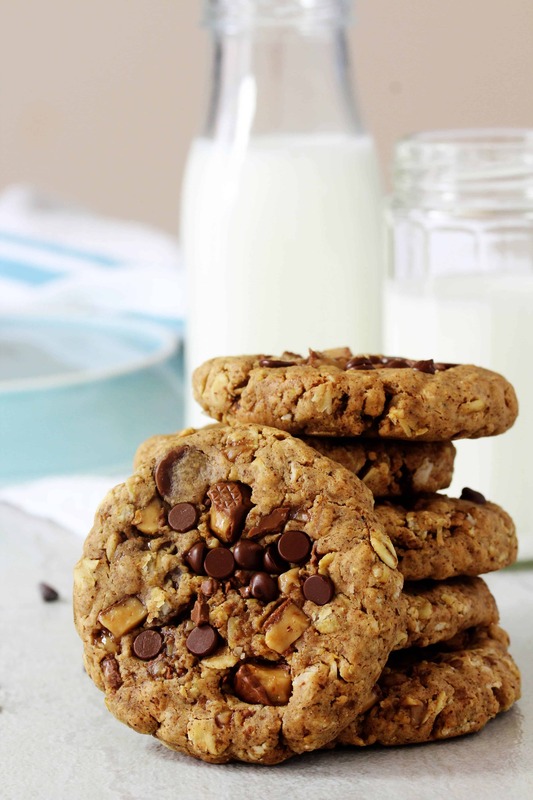 For the cookie base, combine the oat flour, protein powder, tapioca flour, sweetener, baking powder, and salt. 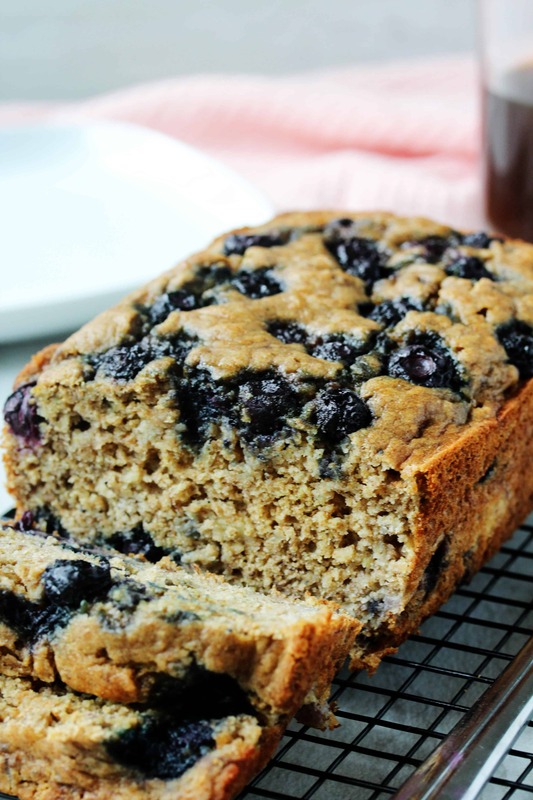 In a separate bowl, combine the almond butter, yogurt, water, and vanilla extract. Add the wet ingredients to the dry and stir until incorporated. Press the dough into the prepared loaf pan. 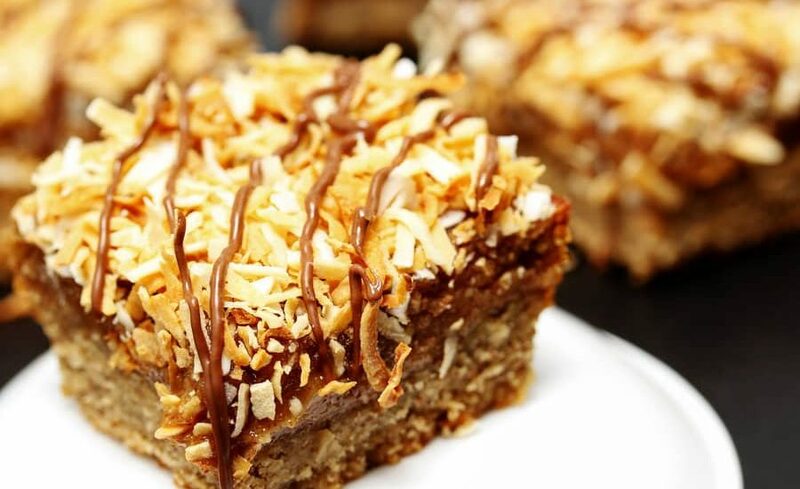 On a baking tray, spread out the coconut flakes. Place the cookie dough and coconut in the oven. Keep an eye on the coconut and remove it once it has browned slightly - usually about 3-5 min. 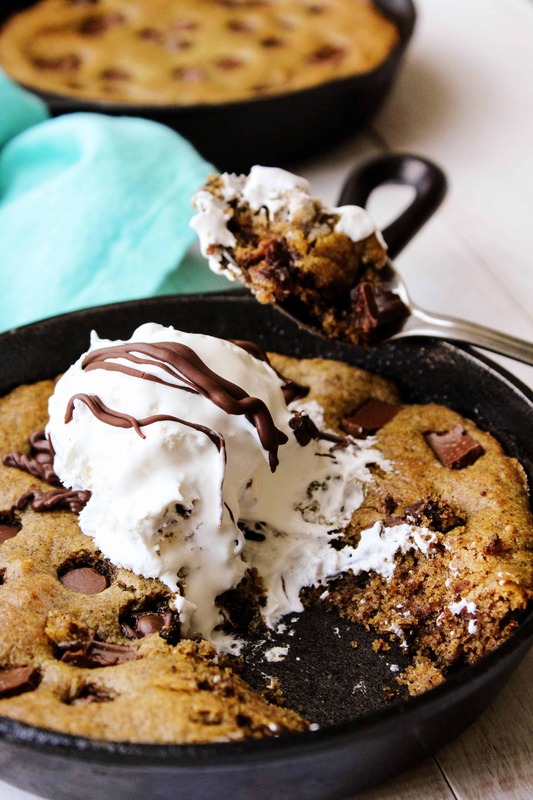 Bake the cookie dough for a total of 9-10 min. Pour the thickened caramel onto the partially baked cookie base and return to the oven. 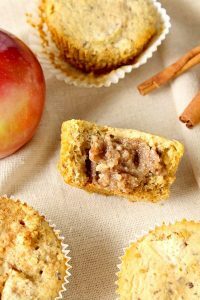 Bake for an additional 20-24 min. or until the edges of the caramel have set and darkened slightly and the center no longer looks wet. If you touch it, nothing should come off on your finger. 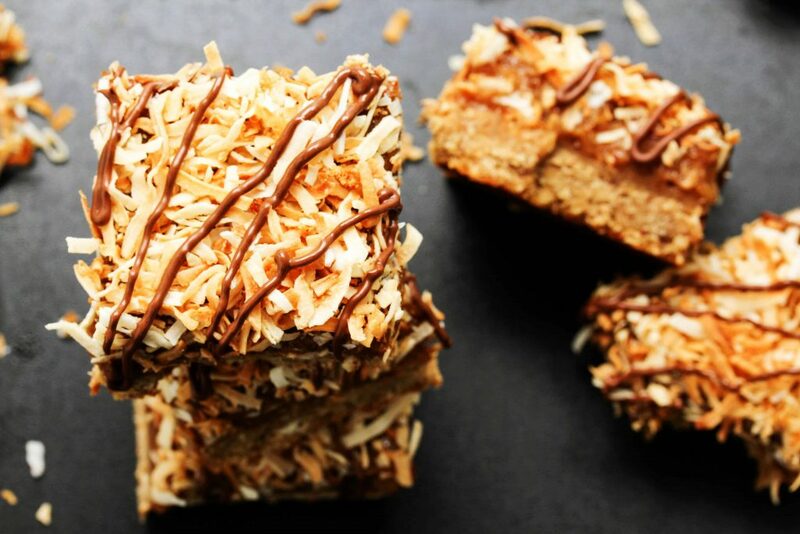 Remove from the oven and immediately sprinkle the toasted coconut on top. Melt your chocolate chips in the microwave (about 30-45 seconds) and drizzle over the top of the coconut. 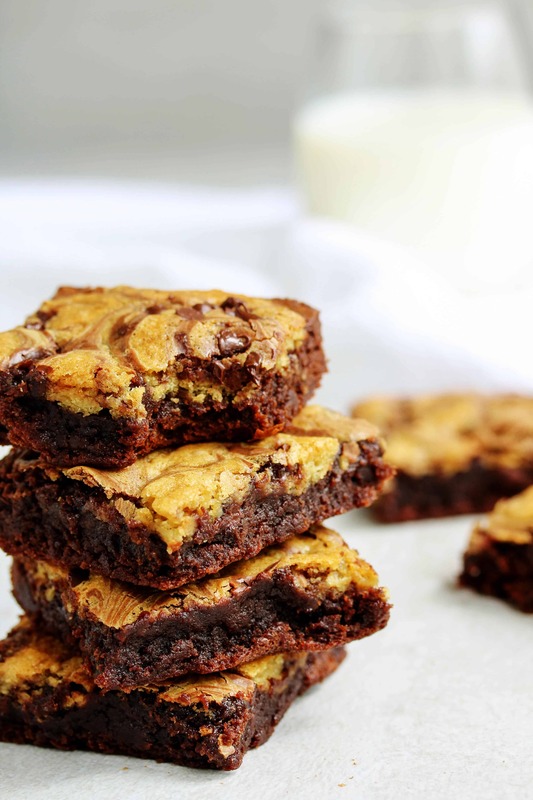 Allow the cookie bars to cool completely, then remove from the pan and slice them up! 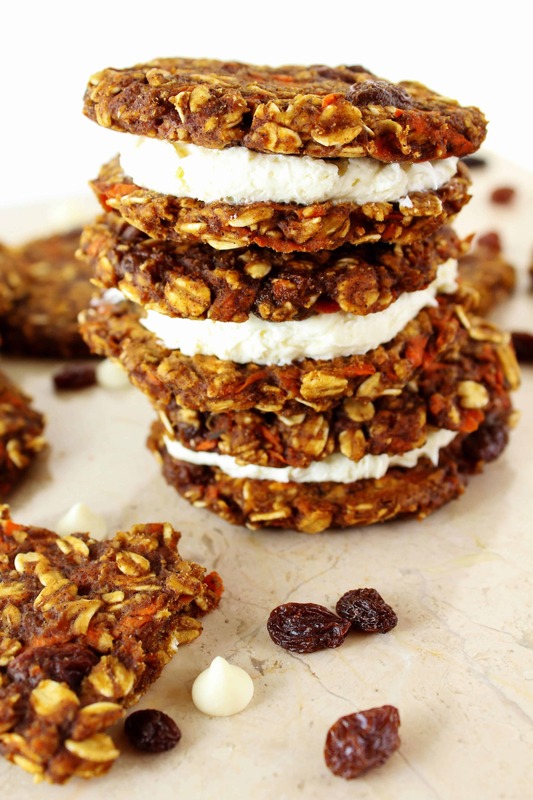 Enjoy your deliciously healthy homemade Samoas! These look amazing! Wondering your thoughts on substituting the soy protein for whey or another protein powder (I currently also have chocolate and vanilla flavored bone broth powder and garden of life protein powder which is plant based). Hey Jess! Any plant=based protein powder should work. I wouldn't recommend the whey since it can make the texture kind of gummy. Hope that helps!